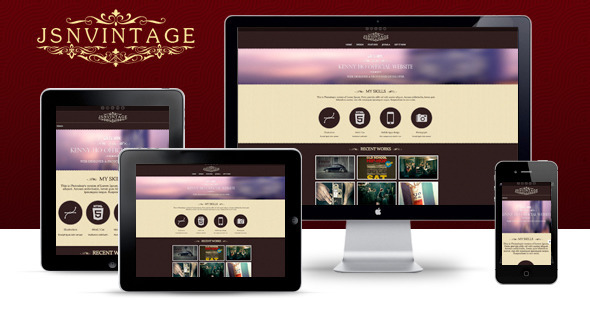 JSN Vintage is the Art and Responsive Joomla Template. The beauty of elegance and classic in design is the gift for Vintage Holic. Thanks to powerful framework and reponsive feature, it runs smoothly on most of web browsers and fit all mobile devices’ screens. Coming with a special design in styling for the most popular blog component EasyBlog, JSN Vintage allows users to start blogging more easily than ever. Free Editions of JSN ImageShow, JSN PowerAdmin and JSN Uniform are three built-in extensions in JSN Vintage sample data. JSN ImageShow is the first Joomla! image slideshow that displays your images in a lively and truthful way. JSN ImageShow now provides you with 6 amazing themes: Theme Classic, Theme Slider, Theme Grid, Theme Carousel, Theme Strip and Theme Flow. More themes will be released in the future. JSN PowerAdmin makes your Joomla administration process easy and enjoyable. It allows you to have full control over your Joomla website in a single screen. You can manipulate elements by using an intuitive GUI with drag-n-drop operations. JSN PowerAdminsupports 10 languages: English, German, Dutch, French, Russian, Spanish, Portuguese (Portugal), Portuguese (Brazil), Polish and Japanese. JSN Uniform is a cool Joomla 2.5 Form Component which is built with attempt to bring Joomla users a nice component, very clean and really easy to use. JSN Uniform first allows you to create a wide range of forms as they want with diversified fields. And then, you can easily manage all submission information of your website’s users. With clear, clean and simple in interface and operation, it’s truly easy to use and suitable for all Joomla users without coding knowledge required. The technical support is handled on the official JoomlaShine forum and via Support e-ticket system . Please kindly include the template name, version, Joomla version and website URL. The average response time is less than 12 hours on weekdays. Support request sent during weekends will be processed with the little delay. In order to get the latest version of a product please kindly submit the account request at Contact Us form. The latest version of a product is provided at NO additional cost.